(Bloomberg) -- When Zlatica Kusnirova votes on Saturday, she won’t be alone in thinking of her daughter. 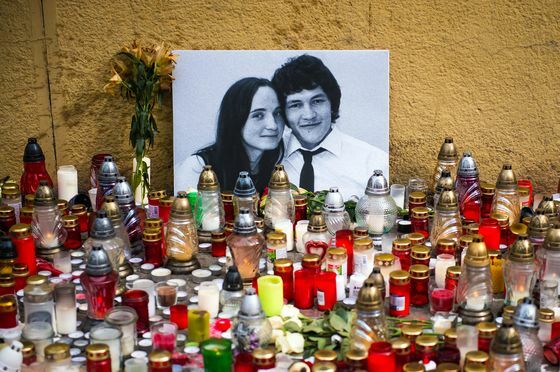 Martina, a 27-year-old archaeologist, was killed by a hit man last year along with her investigative-reporter fiancee in a murder that rocked Slovakia. The slayings exposed a web of corrupt links between business and ruling politicians, sparking the largest street protests since the fall of the Iron Curtain and the resignation of three-time Prime Minister Robert Fico. Although police have since charged a local tycoon for ordering the hit, Kusnirova isn’t satisfied. She and other Slovaks say that, for too long, the country’s political elite have failed to crack down on graft. Now, many are pinning their hopes on Zuzana Caputova, an anti-corruption activist lawyer who, in just months, has rocketed from obscurity to become the frontrunner in the presidential runoff. The presidency is largely ceremonial, although it has a role in granting mandates to form governments and appointing judges. Incumbent Andrej Kiska, a critic of Fico and his government-leading Smer party, is stepping aside after a single five-year term. Slovakia has long been perceived as one of the least problematic countries in the EU’s eastern wing, where surging nationalism in neighbors Poland and Hungary has fueled a drift away from the bloc’s democratic and multi-cultural values. But the murder of Kusnirova and Kuciak tore asunder an image of stability under Smer, which had won popularity amid accelerating economic growth after euro adoption a decade ago. Kuciak’s last story, published posthumously, described allegations that the Italian mafia was fraudulently tapping EU subsidies, aided by Slovak authorities. Graft costs Slovakia the equivalent of 11 billion euros ($12 billion) annually, more than a tenth of economic output, according to a report by the umbrella Greens party in the EU. While Smer has long vowed to fight corruption, no big fish has been convicted, and the country slipped seven notches to 57th place in the Transparency International’s corruption perception index last year. "Slovakia is a captured state," said Zuzana Petkova, director of the Stop Corruption Foundation. A nationwide anti-government movement has now made Caputova a heavy favorite over her challenger, Maros Sefcovic, a vice president at the EU’s executive commission. With her sole previous claim to fame being that she helped block an illegal waste dump, Caputova snatched the national spotlight in presidential debates in January. She’s also a proponent of gay rights, a controversial position in the predominantly Catholic country that hasn’t undermined her standing. Support for Sefcovic, the staunchly pro-EU country’s most powerful figure in the bloc’s leadership, has suffered in his position as Smer’s candidate. He has stressed his devotion to traditional Christian values in a last-minute push to win over the backers of populist and right-wing candidates who exited in the first round, with little success. An opinion survey released last week by the AKO sro pollster showed Caputova would win more than 60 percent of the vote in the runoff. Prosecutors have charged a businessman for ordering the murders that triggered the anti-government outrage, and according to Caputova, he’s the same person who tried to push through the illegal dump that she helped block. Reports citing leaked information from the investigation by the Dennik N newspaper have described his ties to top politicians and law enforcement. That’s decisive for people like Kusnirova. “Sefcovic is Smer," Kusnirova said. "I wouldn’t ever vote for him, not even if he was God."